Back in March I shared a simple St. Patrick’s Day bunting and I loved it so much I thought it would be fun to create a Halloween version! The other night the ladies in our Relief Society group here on the island got together and we each made our own. I used bats, but we also did pumpkins. They turned out super cute and were completed in 30 minutes from start to finish! 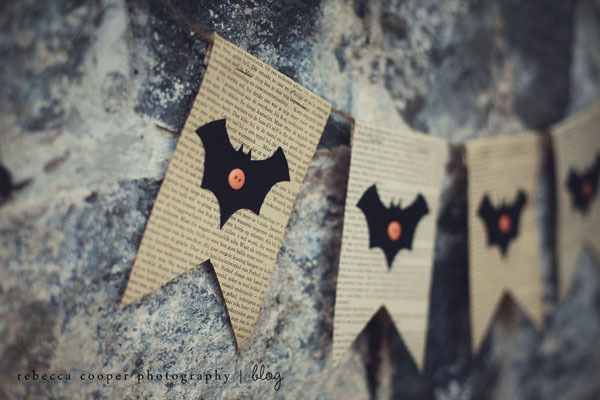 How’s that for a quick and easy Halloween craft! 4. 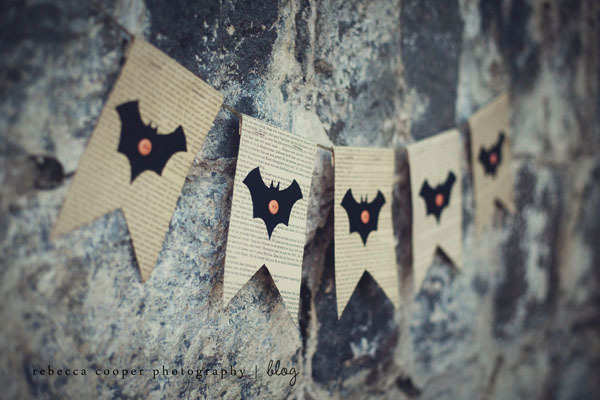 Black/Orange cardstock for bats or pumpkins. 5. Gluestick or other type of adhesive. 6. Some pages from an old book. 1. Using your book pages cut out 5 or more rectangles approximately 3.5″ x 6″ in size. 2. Snip out a triangle shape from the bottom of your rectangles. Hint: From left to right, find the center of your rectangle then measure 1 3/4 ” from the bottom to find where the top point of your triangle will be. 3. Cut out the number of pumpkins/bats you’ll need for your banner. Here’s a great source for bat templates if you do want to draw your own. 4. 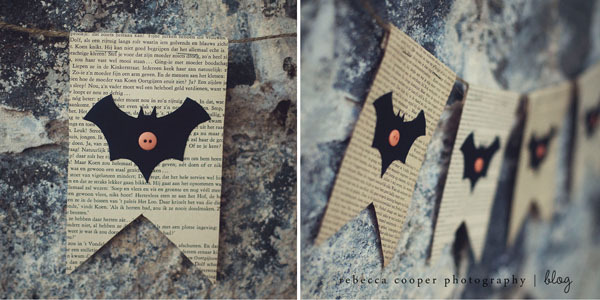 Attach bats to your banner pieces being sure to allow enough room to fold over the top edges. Place a button in the center of each bat. 5. Now you’re ready to put your banner together. Simply cut your length of string and attach banner pieces to string by folding top edge of banner pieces over the string & staple. Space banner pieces evenly along the string by sliding them back and forth as needed. 6. Now hang that cutie up somewhere and enjoy your new Spooky Halloween decor! This banner is sooo cute! If I hadn’t already made one for my mantle I’d make this one! Great job! i love these banners. very cute! I used vintage book pages for a Valentine’s Day banner that I strung with baker’s twine! Absolutely adorable as always Rebecca! Thanks for linking up. I also saw that Amy H highlighted you on the SNAP site. Fun!! love love love this. Triple love. That’s the big time. Thank you for sharing this idea! These are very pretty banner designs. You inspired me! Nice banner designs!You make them so simple and creative..Thanks for sharing idea..